NASA photo reminds us to give thanks for Earth's beautiful, irreplaceable atmosphere. 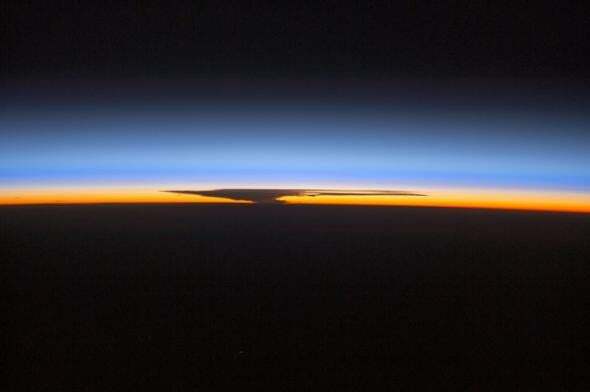 A distant thunderstorm, captured from the International Space Station on Oct. 30, 2014. My family is traditional and requires everyone at the table on Thanksgiving to say what they’re thankful for. I always struggle with what to say. But if you’re an astronaut—besides getting back down to the ground safely—I imagine there’s a pretty common answer: the atmosphere. On a day that’s supposed to be all about the big-picture ideals of peace and unity, I think we should look to the skies. No one understands gratitude better than an astronaut. Earth’s atmosphere is what makes life possible as we know it. When viewed from orbit, it’s impossibly thin—especially when compared to the vast nothingness of outer space. Astronauts often comment on the thinness of the Earth’s life-supporting envelope, and how it suggests the fragility of our planetary ecosystem. They also note that the number of atmospheric layers they can detect with their eyes is much greater than what their photographs show. White has made the overview effect a life philosophy. He’s helped found the Overview Institute, an organization dedicated to immersive space-related art and media that will allow the rest of us Earth-bound landlubbers to experience the transcendent insights that, until now, has been possibly only by space travel. Some things that on Earth we see in the news every day and thus almost tend to accept as a “given”, appear very different from our perspective. We do not see any borders from space. We just see a unique planet with a thin, fragile atmosphere, suspended in a vast and hostile darkness. From up here it is crystal clear that on Earth we are one humanity. If, just for a moment, we can understand how improbable our existence is and remember that we’re all dependent on one another, like it or not, then I believe anything is possible. If you’re stuck in an airport this Thanksgiving, or if you find yourself needing a little inspiration during a break from the in-laws, take a moment to peruse this archive of full-disk images of Earth taken by astronauts or watch this 20-minute film on the overview effect featuring reflections from five astronauts.